Youth sit outside the steps of YMCA Eastlake. Photo by Max Gibson. 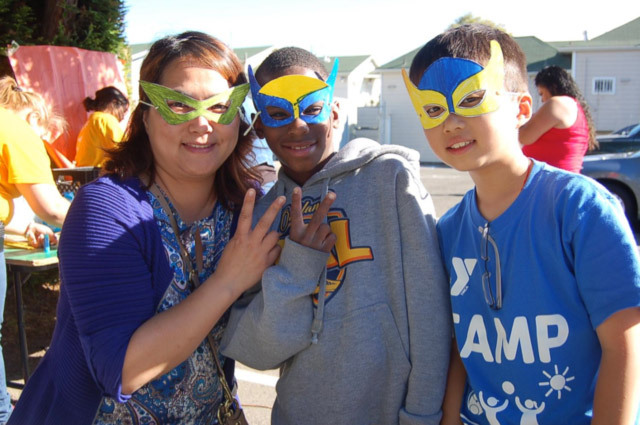 “Be Your Own Superhero,” read the title of Friday’s art and mask making event at the Eastlake YMCA in East Oakland. A haven for youth development and empowerment, the YMCA’s positive space for growth contrasts the surrounding environment that often proves perilous for Oakland youth and young adults. Although celebrated for its vibrant sense of pride, identity and culture, much of Oakland still battles with the troubling realities of poverty and violence. It’s a discouraging pattern, but one that has been combated by individuals working together to quell Oakland’s tragedies, while uplifting the collective spirit of the community. 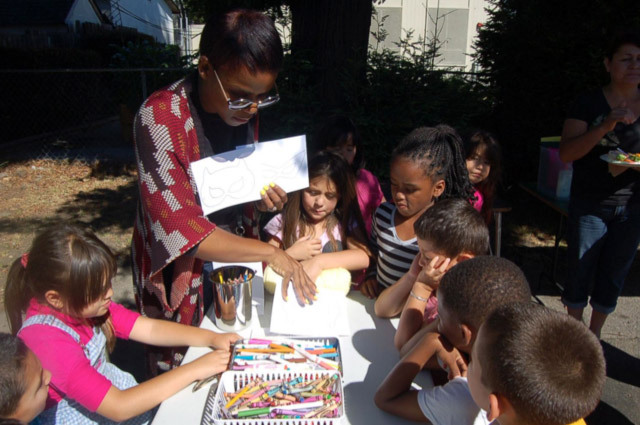 While Oakland is well known for its dedication to social justice and its support for non-profit organizations, the Eastlake Chapter of Oakland’s YMCA is especially notable for its history and commitment to the city as a space for community organizing and growth. After the Mr. Robinson Baker YMCA was severely damaged in the Loma Prieta earthquake of 1989, it took nearly seven years for the complex to be rebuilt. However, through perseverance, the building reopened in 1996, and today welcomes youth from neighboring communities offering gymnasiums, classrooms, gardens and a computer lab in their 15,000 square foot space. Kids select markers at the mask making station. Photo by Max Gibson. Family and friends outside the YMCA Eastlake. Photo by Max Gibson. OMCA Connect staff invited elementary school children to participate in an art-making project. Using crayons, pens, and markers, each child was encouraged to create superhero masks, penguin puppets, or elephant kazoos. Lining the tables with markers, scissors, and string, the summer camp group of more than 20 kids descended upon the tables creating their own colorful creations.